as costume materials are rated. Consider me "pleased". It looked just as good in real life as it does in the picture. 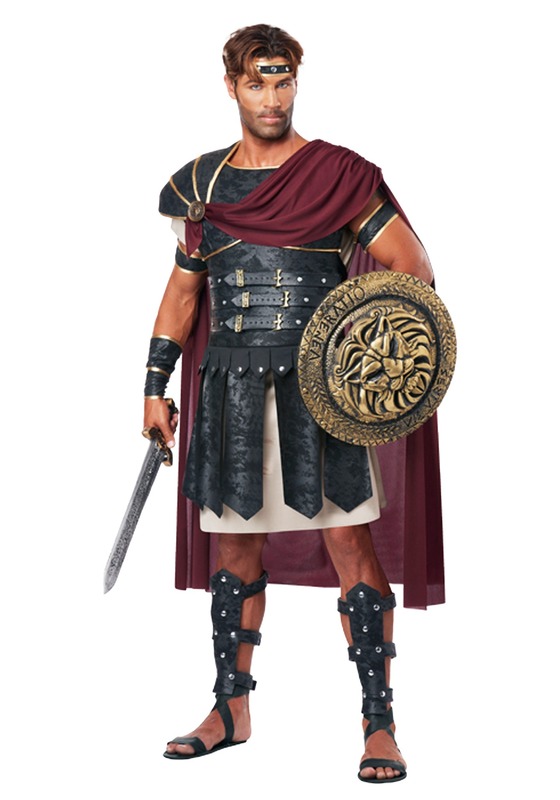 I got nothing but compliments throughout the night of the party that I attended with my wife who had the Roman Empress costume. Great pair of costumes for a couple. As others have noted, the tunic is a bit small, so either where something underneath it or be wary of how you sit down in this costume. The braces were bit large especially for my thin arms and legs, but you can double tie them in no problem. Barring these problems, the quality is very nice, and I was the best dressed at my Halloween party. Recommend it! I wore this for a Halloween party a few years ago and it fit well for the most part. The tunic was a little bit short so I had to be conscious about it riding up when I was sitting down and showing my boxers...which I'm guessing the Romans never wore. I'll recycle it again though and wear it in the future. Got this for my Husband to wear to Disney's Mickey's not-so-scary Halloween Party and it fit him great. He got a lot of compliments on it. He's 5:10 and 200 pounds and size 38 waist and this fit him perfectly and he still had plenty of room to move around without it being tight or restrictive so great costume.